Barbara Beskind developed her interest in Tech design when she was about 11 years old. A couple of decades later, this 91-year-old woman has finally realized her dream at a top design firm in Silicon Valley. "As a 10-year-old I wanted to be an inventor,'' Beskind told Jenna Bush Hager on TODAY Friday. "I've arrived. But it took me about 80 years." "I wanted to make a hobby horse, and I made it out of old tires,'' she said. "I learned a lot about gravity because I fell off so many times." Her initial dreams of becoming an inventor were dashed when her high school guidance counselor told her that engineering schools don't accept females. Instead, she served in the U.S. Army and as an occupational therapist while also writing books and learning to paint. Two years ago, she read about the Silicon Valley design firm IDEO and decided to apply for a job at the firm, which is famous for designing the first mouse for Apple and dozens of other well-known devices. "It took me about two months to write my resume, paring it down from nine pages,'' Beskind said. "Then I wrote the letter and sent it by snail mail." 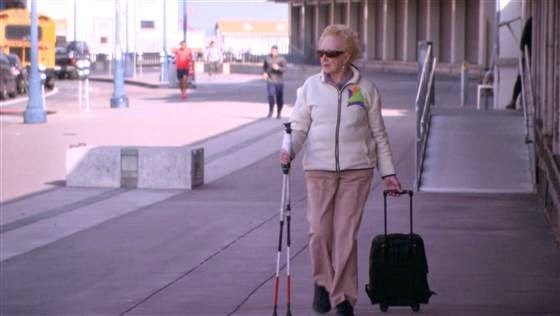 Beskind now takes public transportation and walks a few blocks to IDEO's office in Palo Alto, California, every Thursday, where she is a beloved member of the staff. There's even a company-wide email that gets sent to alert her co-workers, many of whom are six or seven decades younger than her, to when she arrives. "Everybody gives a hug,'' she said. "IDEO is really my second family, and they're very supportive. On Thursdays, I feel 30 years younger." She also has designed what she has dubbed a "trekker,'' a modified version of a walker, which is being developed into a prototype by IDEO. "They can't put themselves in the shoes of the elderly,'' Beskind said about younger designers. "People who design for the elderly think they need jeweled pill boxes or pink canes. We need functional equipment." "I feel that elderly people bring experience that you can't teach,'' she said. Get rid of your devices: "I'm one of the wealthiest people in the world. I'm as wealthy as Warren Buffett, because I measure my wealth by having uninterrupted time. I have no cell phone except one to use for emergency. I have no laptop. I have no smartphone, no iPod, because I can't see them. I have uninterrupted time to think." Expect the unexpected: "I think the beauty of being 91 is that you can look back and see how the little pieces fit into the big pieces of life, and life is a complete puzzle. Only when you get to be this age can you see it, and that's the joy and the excitement of it." Don't let age get in your way: "Age is not a barrier to performance. Live life as an adventure, and expect change and endorse it, embrace it. Because as you age, every day you will be making changes. You will be adapting to changes in the way you have to do things whether they're physical or they're visual. Don't let "old" become your identity: "Everybody has untapped resources. You just have to find them. They may be in music, they may be in childcare, they may be in volunteering at the hospital or at the library. I think with the aging, you so often lose your identity, and I think this is what IDEO gives to me, is the opportunity to explore what my identity is."